Desert Girl came home from school one day this week and asked if we could do a science experiment. I happily agreed, and knew exactly what we would do. One of my brothers had recently sent me a link to a video on Facebook that showed this demonstration. The demo would be a fun art project that showed a little chemistry in action. Step 2: Add a few drops off food coloring (we try to avoid artificial food colorings in our food, but I'm glad I saved these because they are great for science experiments!). Step 3: Add a drop of dishwashing detergent. Dawn was recommended, but we use an eco-friendly one and that worked out fine. Step 4: Watch what happens. Step 5: See the crazy swirls as the colors dance. Sometimes they make fun patterns. You can add another drop to watch the reaction longer. We had so much fun with this demonstration that it had an encore performance after dinner. And in writing up this blog, I found that it's possible to do with Elmer's glue, which then hardens and leaves a lasting impression of this fun reaction. Look out for future art projects! Delta, Utah had its second annual Ready, Set, Tri, a super sprint length triathlon, in September. For adults, the swim was 300m, the bike was about 6 miles, and the run was 1.5 miles. 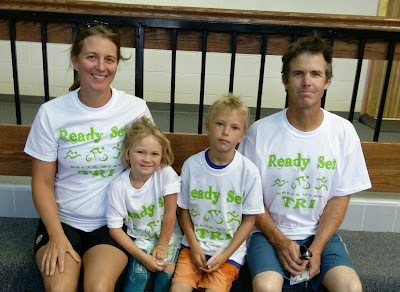 For the kids, the swim was 100 yd, bike 1.5 miles, and run 0.25 miles. I did the triathlon last year but got lost on the bike and didn't finish so I could watch Desert Boy do his first triathlon. He was so happy doing it, so I thought it would be fun to sign up the whole family. Fortunately this year the race organizers waited to have the kids compete so that adults could compete first and then watch their children. I jumped in the pool when it was my time (we were seeded by times we submitted), and then I was off. The bike route was different this year and had pink arrows spray painted, which made it much easier to follow than signs that had folded over, obscuring the arrows (like last year). I enjoyed the swim and bike, but the run was not fun. That is always a difficult transition for me. I finished the bike just in time to let my husband use it. The road bike is a lot faster than a mountain bike, so he was glad to see me. I had recovered enough to get a photo of him coming back into the transition area. Before long it was time for the kids. They had 14 sign up, so they divided them into two groups. Desert Boy was with the first group and did a great job swimming the whole 100 yards with a mixture of backstroke and front crawl. Then he ran out with my husband supervising his transitions. I stayed with Desert Girl as she did her first triathlon. She did back float kick and doggy paddle with a life jacket. She was slow. Very slow. But she did a 100 yards. Her transition took awhile because she insisted on putting on leggings. Those are not easy to put on when you're dripping water! Finally she got going and I rode the 1.5 miles with her. I told my husband he would have the privilege of being her buddy for the 1/4 mile run. He wasn't too thrilled, but he did it. And Desert Girl finished! She was the very last person to finish, which she wasn't happy about, but we kept telling her how good it was that she finished. Desert Girl was still unhappy about being last until they did the awards and she won a coupon for some breadsticks and a drink. She was the only one to get the breadsticks coupon, so she was feeling special. We went and redeemed them right away, and had a great lunch together. I love these small races where the emphasis is on having fun. (Although I have to say there was quite a lot more competition than last year. Last year I was the only one to bring separate biking and running shoes and this year there were quite a few people who did that.) We took an after photo with our matching t-shirts. When I saw how it came out, I thought we probably should have done it as a before photo! The racing season is slowing down. We'll do a turkey trot race (it's a great way to start Thanksgiving! ), but don't have anything else planned for this year. Maybe an obstacle course race for next year! We didn't have the best garden this year. Insects ate all the beans I planted, irrigation problems were daunting, and it seemed like we were growing more weeds than anything. So it was a wonderful surprise to find the perfect pumpkin in our garden. This vine had been growing all summer and looked like it wouldn't produce at all. But it did. And finally it was time to harvest. Desert Boy tried to pick the pumpkin. But it was a little too heavy. I picked it and gave it to him. Did I mention that it was a little too heavy? Now the pumpkin is sitting in front of our house. Desert Girl has recently decorated it, and later we'll make it into a jack-o'lantern. And roast the seeds. And make pumpkin juice (whatever that is, but Desert Boy really wants to do it). And make a pumpkin pie. We have big hopes and dreams for our one pumpkin. My friend Jenny arranged for Scales and Tails to come out and do a presentation for the elementary schools and community. I missed the first part, but when I arrived, everyone was thoroughly engaged in the presentation. I quickly saw why. Jeremy Westerman was an excellent presenter. For example, he had Daisy put on huge gloves and prepped her to take out the creature inside the black box. He asked if she had quick reflexes. She said yes. He asked if she was brave. She said yes, a little hesitantly. He told her it was a good thing she was taking the animal out, because he didn't want his fingers to be bitten off. Daisy was a good sport, and although she looked a little uncomfortable, she stayed up there. Finally came the moment of the grand unveiling. Out came a red-footed tortoise. Not exactly a rip-your-hand off animal. Then out came Tortellini, the baby tortoise. If you go small, why not go really big? Here's Twinkle Toes, a 100-pound Suicata tortoise. The kids got to pet the tortoise shell and Twinkle Toes started grazing on the grass. Jeremy pointed out she's the perfect lawn keeper, mowing it in the front and fertilizing it out the back. Next up was Charlie Brown, a dumeris boa. And then came the green anaconda, who kept trying to strangle Jeremy. That looked like a really powerful snake! Meanwhile, Twinkle Toes kept grazing. Some of the kids weren't too sure of it. Out came one more snake, Nanners, an albino burmese python. The kids got to pet her too. This is a monitor, an animal I didn't recall seeing before. After the show, the younger kids went inside and drew a picture of their favorite animal. I went back out and saw that the fun was continuing, with a repeat showing of the American alligator, who decided to make a run for it. This program was entertaining for both kids and adults and we hope to have them back out again.